The Jeffrey's Hook Lighthouse is available for occasional tours. For a schedule of tours, call 311 and ask for Urban Park Rangers. The lighthouse is also open to the public once a year in October for Open House New York. Due to its location directly under the George Washington Bridge, access by the public is restricted. 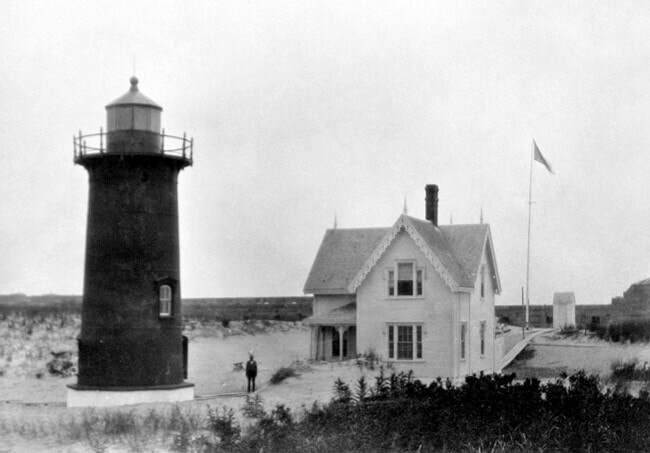 The lighthouse at Sandy Hook, NJ, c. 1884. Courtesy lighthousefriends.com. The rocky outcropping where the Jeffrey's Hook Lighthouse is located was a known danger zone to mariners for many years. In the late 19th century a red warning pole was hung over the outcropping and a light added to the pole in 1889. Acquired by New York City in 1886, the outcropping became part of Fort Washington Park. The need for a lighthouse at Jeffrey's Hook became increasingly clear and in 1920 Congress appropriated the funds to construct one. What they ended up doing was recycling an earlier lighthouse, the North Hook Beacon, built in 1880 on the shores of Sandy Hook, NJ. When the lighthouse at that location became obsolete in 1917, it was transferred to New York City. Completed in 1921, the red steel tower on a concrete caisson became known as the Jeffrey's Hook Lighthouse. Unlike other Hudson River lighthouses, it did not have a resident keeper, but was maintained by keepers who lived nearby. Jeffrey's Hook Lighthouse, 1939, New York Public Library. Jeffrey's Hook Lighthouse under George Washington Bridge, 1939. New York Public Library. Illustration from "The Little Red Lighthouse and the Great Gray Bridge" by Hildegarde Swift, 1942. Library of Congress. With its completion, the enormous suspension bridge had its own set of navigational lights for mariners to use at night, and the lighthouse at its foot became largely obsolete. It was decommissioned by the Coast Guard in 1948 and was put up for public sale. However, in 1942 a woman named Hildegarde Swift had published a children's book entitled The Little Red Lighthouse and the Great Gray Bridge. 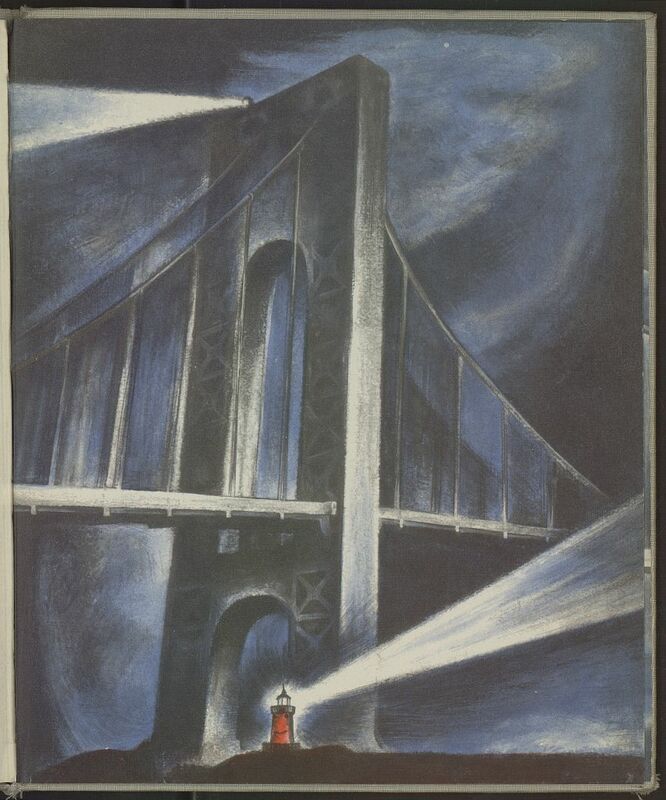 Extremely popular and illustrated with striking imagery, the book told the tale of the lighthouse itself, saddened to be no longer useful in the shadow of the "great gray bridge." One night a big storm rolls in and the keeper fails to light the lantern. The lighthouse thinks that it has surely been abandoned, but when a tugboat crashes on shore in the dark, the Great Gray Bridge calls down to the lighthouse, telling it how needed it is. The keeper finally returns - have recovered keys stolen by mischievous boys - and lights the lantern, allowing the lighthouse to keep doing its important work. Children across the country fell in love with the story of the Little Red Lighthouse and when the Coast Guard proposed to dismantle it, there was a huge public outcry. The children's campaign to save their beloved lighthouse was successful, as in 1951 the Coast Guard transferred ownership of the lighthouse to the New York City Department of Parks and Recreation.